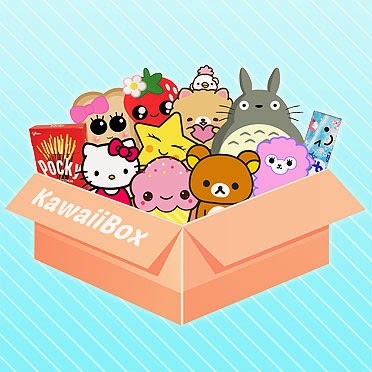 For the stickers, these can be used to make beautiful unique messages, perfect for valentine's day, everyday use or for something special such as a wedding. For me, I used the phrase that we have on our walls too - Live, Laugh, Love. The second option for messages takes a little bit of practice but is such fun to do. Glue guns can be picked up quite cheaply from any good craft store. Just write a message on the glass with the gun, wait for this to go cold then spray with whichever colour you wish, I chose my beloved chalkboard spray paint. 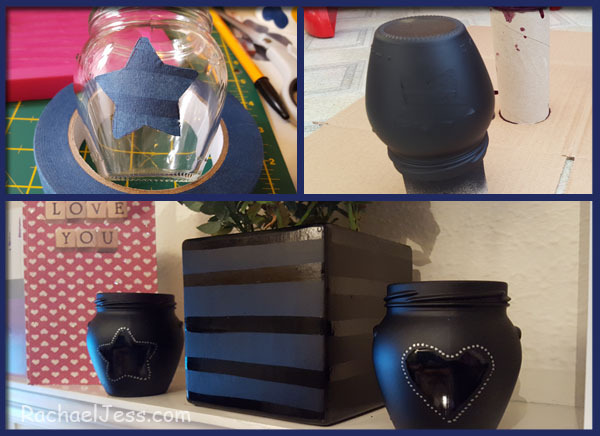 I ended up using stencils which were larger than my tape, so that was a bit of a challenge for me! I found the best way to do this was to place the tape on a piece of paper, draw my images and then cut them out (with the paper still attached) and peel off the tape from the paper straight onto the glass. 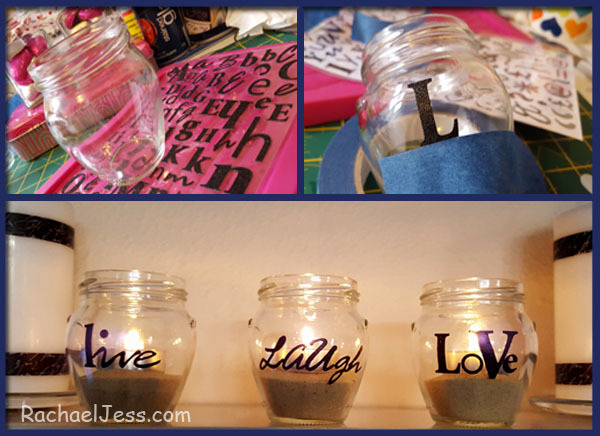 As with the lettering above, I used chalkboard spray paint to cover the jars and left to dry. (Toilet rolls make perfect holders whilst waiting for jars to dry). Once dried I picked off the tape very carefully and then went around each image with the silver sharpie to make it stand out. This, I think is my favourite craft of the five. A very simple and effective way to add a bit of colour to your home or maybe even your wedding tables is to give glass jars a hint of colour. 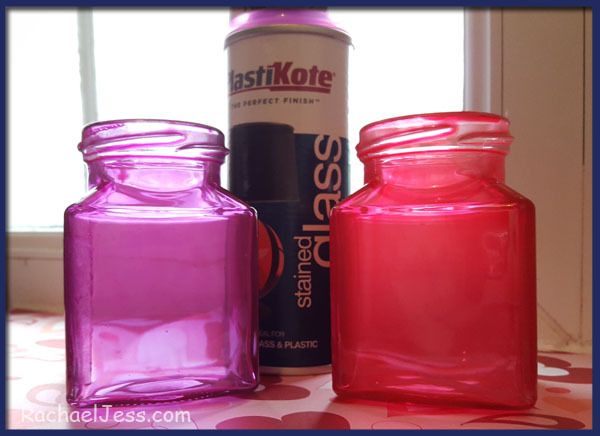 You can pick up glass spray paints from Plastikote - I picked mine up from Hobbycraft no less and I'm really pleased with how these have turned out. Add a piece of ribbon around the top or lace around the middle and these will definitely make wonderful talking points. I love these, and if you're looking for something unique and personal then I think these hit the mark. 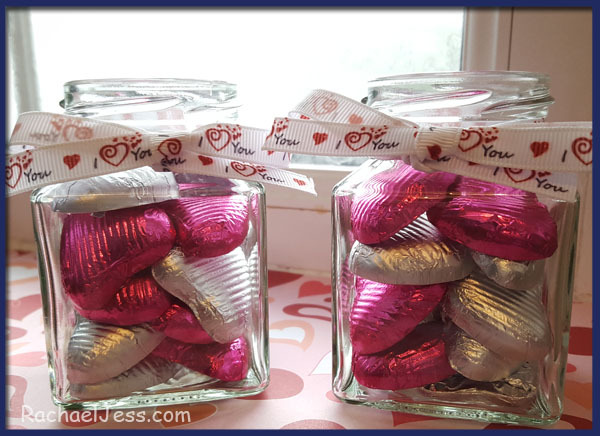 The hearts can be replaced with any sweet or favour to match your colour theme for your wedding as well as the ribbon. This is a very quick, easy and cheap way to decorate your tables and look stunning at the same time. 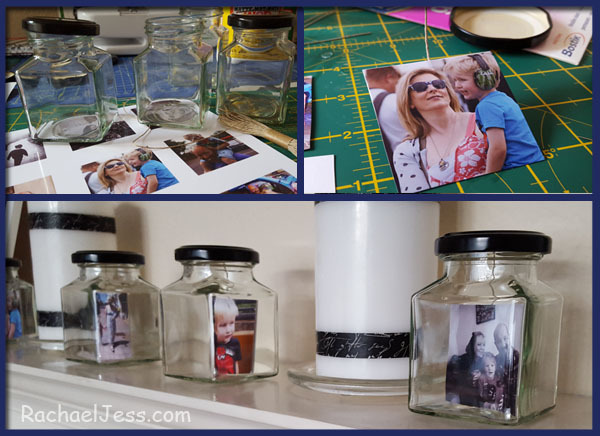 Print out 2 images per jar measuring 2 inches squared. Use the glue dots to attach one end of the string to the underneath of the lid. Glue two pictures together with the other end of the string in between and feed this through the glass jar. The beauty of this quirky picture holder is you can change the view whenever you want with a twist of the lid (or jar). The jam jars used in this post were sent to me from The Bottle Company (south) for review. In my honest option, I feel these are beautiful jam jars which plenty of crafting options for all your needs. These are very reasonable prices for 12 x 12oz square jars will only cost £9.15! 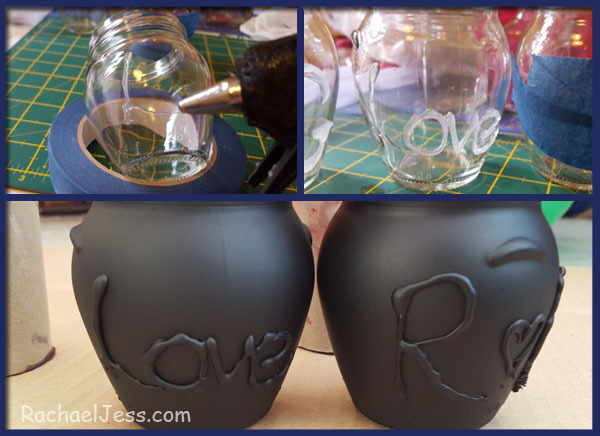 Keep an eye out on future posts as I have a couple more ideas I'd like to share with you for these jars which don't quite fit the love theme.